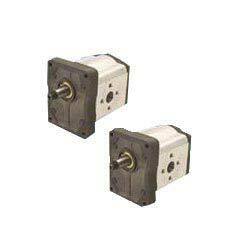 S.M.Shah & Co presents Hydraulic Gear Pumps with displacements of 0.8cm3/rev to153 cm3/rev made using high quality aluminum & conforming to SAE-BIS and DIN Standards. These pumps are available in wide variety of mounting flanges with two & four bolt mountings for easy installation. Direct drive is advisable between the gear pump & the prime mover using a coupling which will allow self alignment of shaft. The pump suction line should be large & free from sharp bends to prevent excessive suction head. 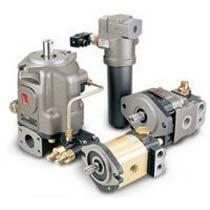 A relief valve should be provided to pump outlet so that working pressure of pump is controlled. The reservoir capacity for industrial applications should be three to five times the open loop flow per minute being drawn from the reservoir. For mobile applications, the reservoir should be sized for not less than 0.75 times the open loop flow .The volume for rams and actuators must be allowed for by providing adequate air space and breathing. Mineral oil based hydraulic fluids are selected as per the requirements of temperature during operation. High tensile aluminum alloy bodies are used throughout the range to ensure uniformity in material properties and maximum fatigue strength. The applications of these pumps include agriculture tractors, construction equipments, material handling equipment, earth moving equipment, mining, drilling equipment & road paving.